I’m as innocent as a newborn baby. I swear. I didn’t kill those men. They threw me in a mental hospital to cover up the real killer’s crimes. I have no idea why, but I have theories. 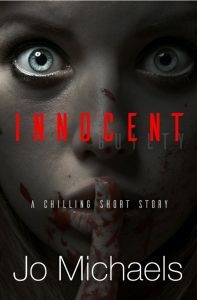 Let me tell you my story so you can decide if I’m guilty or innocent. Jo Michaels loves writing novels that make readers gasp in horror, surprise, and disbelief. While her browser search history has probably landed her on a list somewhere, she still dives into every plot with gusto, hoping "the man" will realize she's a writer and not a psychopath about to go on a rampage. Her favorite pastimes are reading, watching Investigation Discovery, and helping other authors realize their true potential through mentoring. She's penned the award-winning Pen Pals and Serial Killers series and the best-selling educational book for children, Writing Prompts for Kids, which has rocketed the kids that use it into several awards of their own. Most of Jo's books feature the places she's lived: Louisiana, Tennessee, and Georgia. That's given her a special amount of insight to what makes those locations tick. Her works are immersive and twisty, and she wouldn't want it any other way.